Populations of gorgonian and other benthic organisms in the Natural Park of Cap de Creus and Natural Park in Montgrí experienced a high mortality rate during 2017 due the proliferation of filament algae in the Catalan coast during 2017. This phenomenon could be the result of the high temperatures in spring and summer and the high concentration of nutrients in the environment, according to a report on the monitoring of the marine environment in the Natural Park of Cap de Creus and the Natural Park in Montgrí, Medes Islands and Baix Ter in Catalonia (Spain). This report, launched by the Catalan Government and carried out by the University of Barcelona, was led by researcher Bernat Hereu from the Faculty of Biology and the Biodiversity Research Institute of the University of Barcelona (IRBio). This work gathers the first results from the scientific monitoring program launched by the University of Barcelona and Generalitat de Catalunya from 2017 to 2020 to assess the conservation state of these marine parks in the coasts of Catalonia. Coralline communities, Posidonia fields, vertical walls of limestone and algae forests, the shelter and food of many marine species, are part of the rich biodiversity of the Catalan marine Natural Parks: Natural Park of Cap de Creus and Natural Park of Montgrí, Medes Islands and Baix Ter. These marine parks ─some of the most protected and emblematic marine areas of the north-western Mediterranean─ keep a unique natural heritage, but which is highly sensitive to impacts with natural or anthropogenic origins on the marine environment. 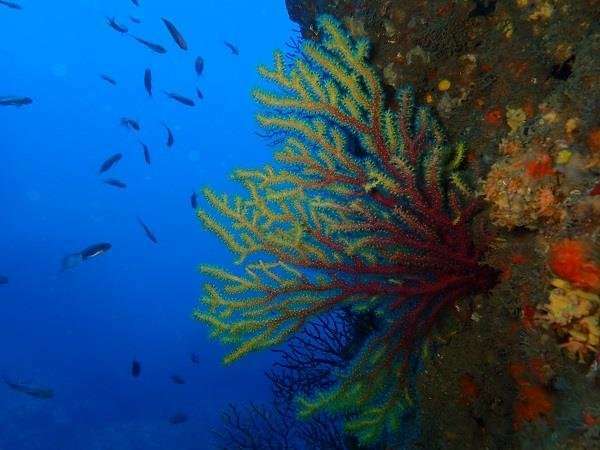 As part of the scientific program, experts from UB-IRBio and the Institute of Marine Sciences (ICM-CSIC) analysed several indicators (red gorgonian, red coral, bryozoa, algae communities, sea urchins, caves, eulittoral communities, etc.) to assess the ecological status of biological communities and the impact of human activities (scuba diving, coastal and sports fishing, poaching, etc.) on the marine ecosystem. This line of work provides with new strategic tools to improve the management of natural heritage in the Natural Park of Cap de Creus and Natural Park of Montgrí, Medes Islands and Baix Ter. Red coral (Corallium rubrum) is a colonial cnidarian which helps structuring coralline communities in the Mediterranean. According to the report, these species' populations are best preserved in the Natural Park of Montgrí, Medes Islands and Baix Ter ─more biomass and higher proportion of big colonies─ compared to those in the Natural Park of Cap de Creus. However, none of the colonies shows the expected sizes after more than 30 years of preservation, the experts warn. In the future, therefore, it will be necessary to assess the effect of the fishing area closure (2018-2018) on the size of these colonial organisms. Filamentous algae and higher temperatures are factors that altered the population of the gorgonian Paramuricea clavata, especially in this park. This species, typical from the rocky seafloors in the Mediterranean, has a slow population dynamics and is especially sensitive to environmental disturbances (scuba diving tourism, etc.). Submarine caves also show the ecological impact of human activities (air pockets, erosions, etc.) which also alter the composition and abundance of benthic fauna. Applying a precaution principle and trying to reduce the frequency of scuba divers is a strategy to be implemented in order to improve the future of the most sensitive marine species, according to the experts. Regarding the bryozoa, the density of the population is very low in those areas that are frequented the most in this marine park, a situation which affects high and exposed colonies. Although there are areas in a good preservation state –for instance, Vaca station- the temporary monitoring shows that bryozoan populations are in a clear regression in the areas with a higher human impact. In this marine park, the state of urchin populations changes according to the level of protection, as stated in the report. The new report reveals that mortality of gorgonia in the Natural Park of Cap de Creus is not as high as in the coast of Montgrí, although the number of affected colonies is growing. Populations of the brown algae Cystoseira mediterranea are denser and extensive in the Natural Park of Cap de Creus than in the Montgrí coast. Regarding the algae population, researchers detected a colonization process by the red coral Corallina elongate in seafloors, especially in Cap de Creus. In this marine park, algae communities are simplified but they have a wide range of communities dominated by filamentous algae and grass. Sea urchin populations do not show a clear effect of the reserve, probably due the lack of recovery of fish communities. Regarding the bryozoan community, researchers identified abundant colonies of Myriapora truncate, while there were almost no signs of Pentapora fascialis. Big fishing nets that are left at sea are some of the findings of this research –with scuba sets and up to 35 meters deep- in the Montgrí coast. This initiative is useful to identify environmental impacts related to the threats to marine life (filamentous algae on sessile organisms, abandoned fishing nets, etc.) and to design management tools to improve the preservation of coastal lines, especially those that are sensitive to the human impact. The found nets were taken from the seafloor during previous campaigns, in the project "Evitem la pesca fantasma". This initiative, carried out successfully in the Natural Park of Montgrí, Medes Islands and Baix Ter –more than twenty abandoned fishing nets were taken- has been expanded over the entire Catalan coast, in coordination with the directorate-general of Fisheries and Maritime Affairs of Generalitat de Catalunya (www.pescafantasma.cat). Eulittoral communities show a good preservation state, although limestone in exposed areas shows a rise of mortality. Everything points out that mortality of limestone –detected in 2015- is occurring once again this year, as a result of the rise of temperatures, caused by climate change. The report describes the massive ecological impact of some filamentous mucilage algae, an episode that affected several benthic habitats and species of great part of the Natural Parks in Catalonia between May and September 2017. Filtering organisms (such as gorgonia or coral) were the most damaged ones by this algae proliferation, which was high in areas between 10 and more than 30 meters deep. These episodes are hard to control –there is no effective technique to remove the algae- and require the need to prevent nutrients from being thrown into the marine environment when massive algae growth is detected. Data also suggests there is overpopulation of sea urchins that proliferate due a lack of predators, fish. These urchins, in addition, keep algal communities low-developed. However, in the marine reserve in Medes Islands, researchers saw how fish populations have an effective control over urchins, so that they favoured the development of algae communities with abundance and diversity of structural species. The monitoring of biodiversity is an essential tool to apply the model of adaptive planning, already applied in protected marine areas. This scientific monitoring has been designed and expanded to respond to a new regulation system based on adaptive planning, which requires a precise temporary study of indicators on the preservation state of the marine ecosystem (in particular, where several anthropic activities are conducted). The adaptive planning model requires the daily assessment of the measures that were set out of the obtained data from the yearly monitoring of marine communities, which are useful to take decisions and guarantee the objectivity of this model.